WEST LAFAYETTE, Ind. — Purdue University’s Department of Entomology will bring Tippecanoe County fifth-graders to campus on Tuesday (Oct. 13) for its 13th annual Science on Six Legs: An Insectaganza of Education. 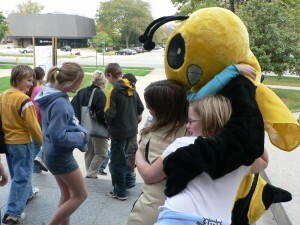 Betty Bee greets Tippecanoe County students at the 2007 Insectaganza. More than 760 fifth-graders, 32 teachers and 70 adult chaperones from 12 different schools will participate in a full day of insect activities designed to promote science education through the biology, ecology, diversity and the novelty of insects. The event runs from 9 a.m. to 3 p.m. The program was first created as a result of requests from fifth-grade teachers for insect-related talks that would address the Indiana State Academic Standards for Science. Students will participate in “Mesozoic Insects,” an insect lecture led by Purdue entomologist Jeffery Holland; insect dissection, led by undergraduate and graduate entomology students; “Entomology Live!” a theatre presentation led by Purdue entomologist Tom Turpin; and “Quiz Bowl,” moderated by Purdue entomologist Arwin Provonsha.